Infochemicals are the information-conveying chemicals that have a functional role in regulating intercellular signaling and cell fate of microorganisms. We explore the role of infochemicals in three major biotic interactions that have profound significance in controlling algal bloom dynamics in the oceans; cell-cell communication, predator-prey and host-virus interactions. We reveal the signaling role of infochemicals (e.g. DMS) in controlling cellular metabolism, growth, mortality and defense mechanisms. Deciphering the metabolic landscape during host-virus interactions. Identification of the biosynthetic pathway for production of the ubiquitous infochemical DMS/P in bloom forming algae. Characterization of the physiological and ecological roles of DMS/P. Deciphering how infochemicals mediate algae-bacteria interactions. Understanding the role of infochemicals in micrograzer-algae interactions. Developing the use of infochemicals as metabolic “fingerprints” to track microbial interactions in the natural environment. DMSP catabolism in the ocean is mediated by both bacterial and algal DMSP lyases. 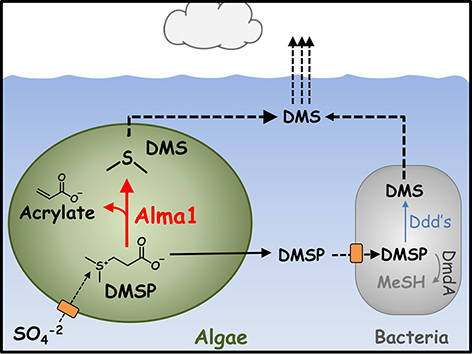 DMSP is predominantly synthesized by algae. Under grazing or viral lysis, DMSP is released and catabolized by marine bacteria via demethylation (DmdA) or lyase activity and DMS release (Ddd's). Alternatively, algal DMSP can be directly lysed by Alma1 to release DMS and acrylate. Large emissions of the volatile DMS to the atmosphere (dashed line) can be oxidized to sulfur aerosols acting as cloud condensation nuclei.